If a mentally ill individual in downtown Sarasota has been “trespassed” — ordered by law enforcement officers — to stay away from a particular business, and that individual shows back up on the premises, the person generally will be arrested, taken to the county jail and booked. Even though the standard bond is relatively low, the individual likely will not be able to afford it, so he will have to wait in jail — perhaps for two to three weeks — before he appears in court. He may end up accepting a plea deal offered by the State Attorney’s Office that entails the time he already has served in jail. And then, after he has been released, he will head right back downtown and get arrested again — maybe for trespassing once more, or perhaps for having an open container of alcohol. At that point, his time in the judicial system will start all over again. 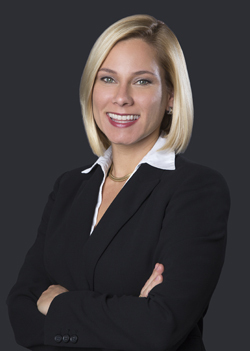 That is exactly the type of scenario 12th Judicial Circuit County Court Judge Erika Quartermaine has been trying to prevent, she told the Sarasota County Commission this week. “The majority of these people are homeless,” she pointed out. Working over the past year with the State Attorney’s and Public Defender’s offices, the Sarasota County Sheriff’s Office and her colleagues in the 12th Judicial Circuit, she has proposed a Comprehensive Treatment Court (CTC) that would be partly funded for three years by a $400,000 State of Florida Criminal Justice Mental Health and Substance Abuse Reinvestment Grant. 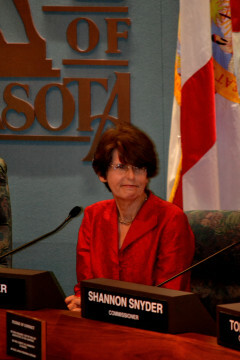 To win that grant, she needs matching contributions from the County and City of Sarasota, as well as private foundations, she explained. On April 27, on a motion by Commissioner Christine Robinson, the county board approved matching funds in its 2017 and 2018 fiscal year budgets out of money already set aside to help the homeless. Robinson’s motion also called for County Administrator Tom Harmer to work with other staff to identify the necessary funding for the third year. The total Quartermaine sought was $441,667. The Gulf Coast Community Foundation’s board has agreed to a $40,000 grant, Quartermaine told the county commissioners. 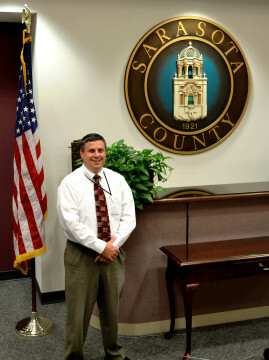 However, Wayne Applebee, the county’s director of services for the homeless population, pointed out that that funding is contingent upon the City of Sarasota making a commitment to provide matching money. Sighs of commissioners were audible after Applebee made that statement. The City and County commissions have disagreed for about two years on how best to address homelessness in the community. “Ideally,” she added, the city would participate. Commissioner Charles Hines joined Robinson and Chair Al Maio on April 27 in praising Quartermaine for her initiative. If an emergency homeless shelter had been established in the community, he told the judge, he truly believed many of the people the program seeks to help would not have appeared in court. “Our hopes are to stabilize a population that is repeatedly arrested [and] spends a significant amount of time in jail” Quatermaine told the county commissioners this week. Thanks to Gov. Rick Scott’s signing of Senate Bill 439, she added, the “the scope of those who would be eligible” for the CTC program has expanded. Jails all across the United States are reporting increases in the number of mentally ill offenders who have been incarcerated because of “low-level offenses,” she continued. That situation partly is a result of the closing of mental health facilities. “What we’re seeing is the jail becoming a de facto mental health institution for these individuals who have alienated themselves from family or are unable to find services or just not able to function well at all in society,” Quartermaine added. The CTC program would be similar to one in Miami-Dade County, she pointed out. Since that program has been underway, she said, the recidivism rate for arrestees with serious mental illnesses — such as bipolar disorder and schizophrenia — has dropped from 76 percent to 20 percent. An amended Memorandum of Understanding regarding the proposed CTC program has been signed by representatives of the 12th Judicial Circuit, the Sheriff’s Office, the State Attorney’s and Public Defender’s offices and Centerstone, she continued. The latter nonprofit organization also has provided a budget for the next three years; it calls for assisting 25 people in the first year, 30 in the second and 40 in the third year of the jail diversion program, she said. The plan is not to keep anyone in the program “for a significant amount of time,” she pointed out, adding that she believes 80 to 120 people a year can be helped. The first year’s expense would be $765,000, she added. Although Centerstone has been “very, very conservative” in its planning, Quartermaine continued, she expects the client turnover to be as fast as 45 days. When Commissioner Robinson asked about the potential for the clients moving into long-term housing, Quartermaine replied that the initial goal is “to get to the underlying cause” of the individual’s problems. Applebee, the county’s director of services for the homeless, told the commissioners that the program calls for getting the people it helps into subsidized housing or regular homes. A number of the individuals probably are eligible for disability assistance, he added, which would help them pay for housing. The goal is to help them become as self-sufficient as possible, Quartermaine added, and not just reliant on government services. “It’s not a one-size-fits-all approach,” Quartermaine stressed. Studies also have shown that if individuals are homeless and mentally ill, she also pointed out, they likely are not good candidates for a Housing First approach. The Housing First model has been the City Commission’s approach to helping the homeless in the community, while the County Commission has remained focused on establishing a come-as-you-are shelter. It’s time the City of Sarasota took decisive action on the homelessness issue. This should be a priority, especially now that more and more homeless are being displaced from their customary hangouts by the rampant construction of expensive condos in the downtown area. It’s not fair to ask the City’s police to be psychologists and substance abuse counselors in addition to keepers of the peace among the homeless population. All the shelters in the world won’t help the situation unless the mental illness and substance abuse issues are addressed first. I personally intend to write to my City Commissioner and express my support for Quartermaine’s efforts. In the long run, I bet it would be more economical as well as more humane for the City to fork over the start-up cash for her proposed program.